National Meatball Day is something I can get with. A bowl of pasta is already comforting but add some delicious and flavorful meatballs to your bowl and a quick and delicious meal awaits. Today is national meatball day and 2 NYC chefs want us to eat fabulously with their prized meatball recipes. The traditional meatballs from Park Avenue Tavern and the vegetarian meatballs from Boulton & Watt are 2 fabulous recipes that you can keep in your recipe arsenal. Preheat oven to 450° Mix all of the ingredients in a mixing bowl my hand until all incorporated. Add a little olive oil to your hand, and roll the balls out to a size a little bigger than a golf ball. Place the balls on a well-oiled pan and roast in the oven for about 20 minutes until the internal temp reaches 165°. Remove from the oven and let the balls cool down before enjoying with your favorite sauce and pasta. Spaghetti Squash - Cut a spaghetti squash in half. Season with salt and pepper and drizzle with a little olive oil and roast squash in 350 degree oven. When spaghetti squash is almost tender, cool and scrape out the inside. Your strands should have a "al dente" texture. Tomato Confit- blanch plum tomatoes in boiling water for about 25 seconds. Remove tomatoes and place in a bowel of ice water and peel off the skin. Once peeled, cut tomatoes in half and remove the seeds. Place tomatoes in an oven proof dish, submerge completely in olive oil with a few garlic cloves, some thyme sprigs and cover and cook in the oven at 300 degrees till tender for about an hour. Parmesan Broth- place 1 pound of parmesan rinds in a large pot. Cover rinds with about 1/2 gallon of water, a couple sprigs of thyme, and a couple cloves of garlic and reduce. Once reduced, strain and set the parmesan broth to the side. Eggplant “Meatballs” - Peel both eggplants and boil until tender and allow to cool. Using some cheese cloth (or paper towels) ring out all of the water. Chop eggplant finely and add breadcrumbs, parmesan cheese, chopped garlic, minced onion, parsley, basil, salt and pepper in a large bowl . Shape eggplant mix into small balls. Once "meatballs" are formed pan fry in canola oil until crispy and brown. To Compose: In a sauté pan add a few tablespoons of olive oil and one clove of sliced garlic. Once garlic begins to brown add 1 cup of parmesan broth, 2 cups of spaghetti squash and simmer for two minutes. Add 4 pieces of tomato confit along with fresh chopped basil and parmesan cheese to spaghetti squash and season with salt and pepper to taste. 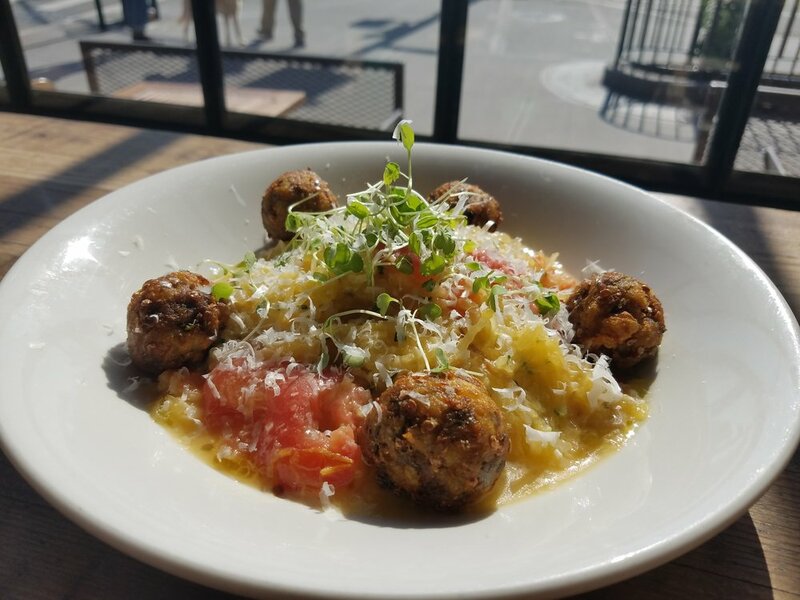 Spoon spaghetti squash in a bowl, and top with eggplant meatballs and more parmesan cheese. Garnish with olive oil and more basil.